Throne of Glass is one of my all-time favorite book, and with the last book coming out in just a couple of months, I want to review each installment in this epic series. Review In A Nutshell: Throne of Glass is an amazing, feminist fantasy that is sure to keep you on the edge of your seat with epic action, fascinating mystery, and great characters! 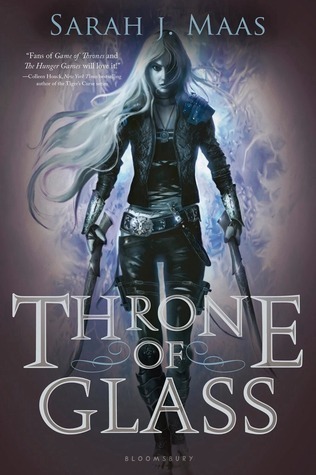 Throne of Glass follows the kingdom of Ardalan’s most renowned assassin, Celaena Sardothien, who has been enslaved in the brutal salt mines of Endovier for a year after being captured. When Prince Dorian offers her a chance to earn back her freedom, Celaena will do anything. Even joining a competition against the most ruthless criminals and warriors in order to become the King’s Champion, the King of Ardalan’s personal killer. When some of the other contestants start being mysteriously killed, Celaena must discover the killer’s identity before she becomes their next victim, but she uncovers more secrets than she ever expected. The world of Throne of Glass is an elaborate fantasy world that just gets more and more developed with each novel, while never feeling too intricate. Sarah J. Maas throws you into this fantasy setting, providing necessary details but never overwhelming you. Sarah J. Maas writes beautifully. Her descriptions are vivid, immersing you in the scents and sights. There are so many inspiring and quotable lines from this book (and later books) that stand out when reading, while also feeling natural for the characters. There is also plenty of relatable and funny dialogue to break up the action and mystery in the novel. The only downside to her writing style is that it does tend to feel a little repetitive (especially in later books). She has a few words she seems to favor, and some sentences you’ll see quite a few times over the course of the series. The pacing in Throne of Glass is done very well, with no slow moments as you dive into this mystery and action-packed book. The exposition never slows down the scenes, but it does take some time, in the beginning, to learn about the world. I absolutely love all of these characters. Sarah J. Maas writes complex characters (with complex names to match). Celaena is such a strong, badass protagonist who isn’t solely good but remains likable. She also shows that you can be girly and tough, that you can enjoy romance novels and dresses and also know the quickest ways to kill a man. Dorian and Chaol are both equally interesting characters, with their own arcs and development that just get better as the book (and series) goes on. Dorian is like a puppy and I just want to protect him, okay? The villains in this book are probably the least interesting of the series but still held their own. The biggest downfall with the characters in this book (and most Sarah J. Maas books) is the lack of diversity in the cast. While it does get better in later books, don’t expect to see many POC or LGBTQ+ characters. It’s definitely disappointing. As for the relationships in this book- I think Sarah J. Maas handles them well. There is a bit of a love triangle, but it is handled well and didn’t bother me at all. Sarah knows how to make you absolutely root for one person, then in the next chapter completely change your mind. Honestly, the biggest ship in this novel is the main characters with a full night of sleep. Throne of Glass is a must-read for any fantasy fan. Be prepared to be hooked on this epic series!